Apple Mail's default toolbar probably works as is for many users. It has all of the most often used mail commands already present. But the toolbar can do so much more with just a little bit of customization. You can add functions such as Redirect, Add to Contacts, Print, as well as Show and Hide Related Messages. And this only a few of the things you can add through customization. Many applications let you customize their interface, but some of them make you work at it. 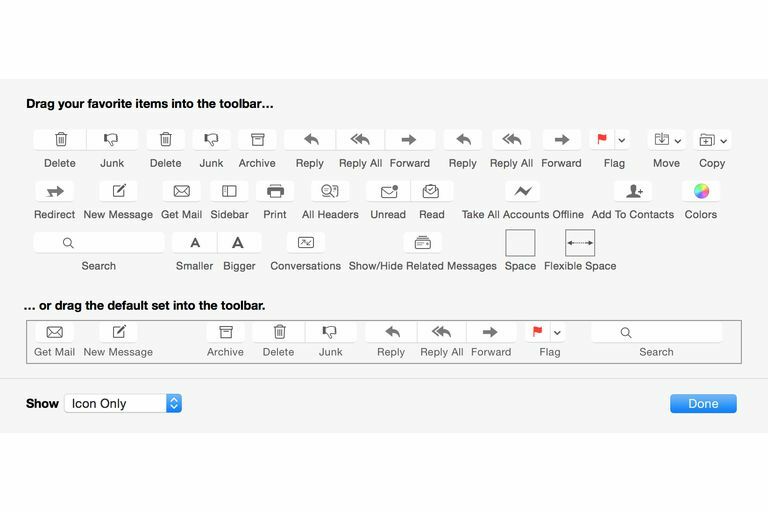 Customizing the toolbar in Apple Mail is a piece of cake. All it takes is a little clicking and dragging. To customize the Mail toolbar, right-click in a blank area of the toolbar and select Customize Toolbar from the pop-up menu. Click and hold the icon of your choice to select it, and then drag it to the toolbar. As you drag the selected tool to the toolbar the existing icons will move aside to make room for the new button. When the icon for the new tool is in a spot you like, release the hold (let go of the mouse or trackpad). Repeat for additional icons you wish to add. When you've finished adding icons, click the Done button. If you drag an icon to the wrong location, or you're just not happy with the way the toolbar looks, you can easily reorganize it. Make sure the toolbar is still in the Customize Toolbar mode. To move an icon in the toolbar, click the icon to select it and then drag it to the target location. Icons that are occupying the location you move an item to will move out of the way to make room. To remove an icon from the toolbar, right-click the icon and select Remove Item from the pop-up menu. Hold down the Command key (cloverleaf key). Drag an icon in the toolbar to a new location. Once the icon is in the position you wish, release the Command key. By default, the Mail Toolbar displays icons and text, but you can change to just icons or just text if you prefer. If you have the customize window open, click the Show dropdown menu in the bottom left corner of the window and select Icon and Text, Icon Only, or Text Only. If you don't have the customize window open, right-click a blank area of the toolbar. Select Icon and Text, Icon Only, or Text Only from the pop-up menu. If you get carried away with clicking and dragging icons, it's easy to start over. To return the Mail toolbar to the default arrangement, right-click in a blank area of the toolbar and select Customize toolbar from the pop-up menu. Click and drag the default set of icons from the bottom of the customize window to the Mail toolbar, and then click the Done button.